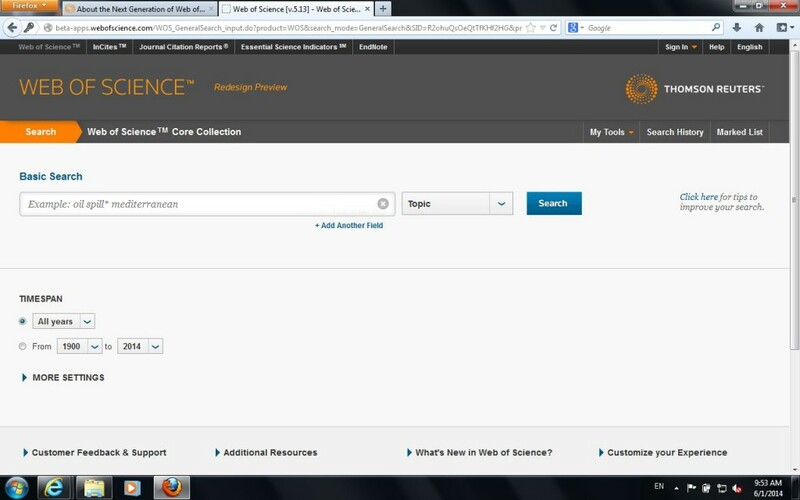 Thomson Reuters announced the launch of the re-design of their flagship search platform Web of Science recently. The change should take effect on Monday 13 January 2014. The TR team was here at NTU Library to brief the librarians about key changes. 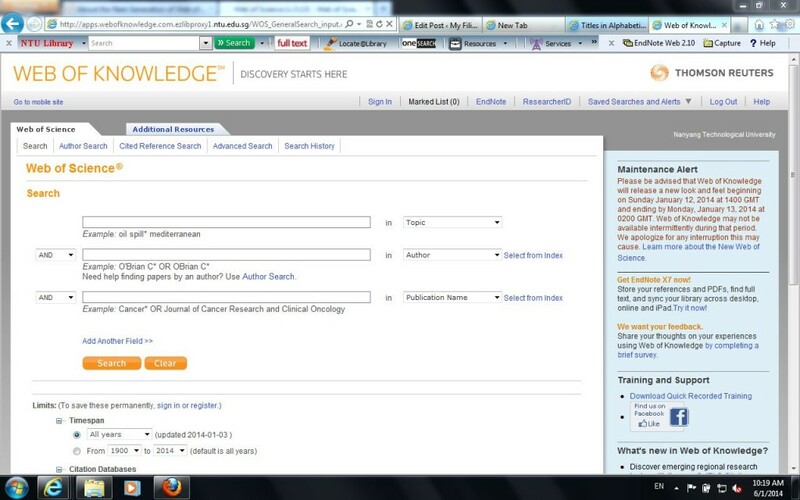 The search platform known as Web of Knowledge will be re-branded as Web of Science. The current citation indexes consisting of the Science Citation Index, Social Sciences Citation Index, Arts & Humanities Citation Index, Conference Proceedings Citation Index, Book Citation Index, Current Chemical Reactions and Index Chemicus will be re-named as Web of Science Core Collection. The trainer explained that they had received numerous feedback that users are confused by Web of Knowledge and Web of Science. The first was a citation analysis tool and the second is a database platform. The problem was some of the features overlapped. I too tend to select Web of Knowledge even when I am performing a literature search. So, I guess it was a timely re-design and consolidation of the 2 search platforms. Essentially, there is better integration of the content in the indexes and a simplified look and feel. This is a preview because the product hasn’t been launched yet. First impression? The redesign of the search page is cleaner and simpler. The Google effect 😛 It is a good change. There really isn’t a need to offer users 3 search boxes for Topic, Author and Publication Name. One search box with a drop down menu for selecting which field to search suffice. If users need to do a combined search, they can add another field. Results page receive minor additions like new spell-check or predictive search terms, sorting by number of times cited and quick links to full text or link resolver. The search limiters remain more or less the same. At the article-level record, we can now check the Journal Citation Reports (JCR) and Essential Science Indicators (ESI) information related to the article, journal and topic. This is a better integration of the content we possess. The information is presented as hyperlinks. Currently, to look up the JCR or ESI information, users have to launch the other 2 platforms and perform the search from scratch. Now, they are just a click away. A great time-saver. Users can also tell, at a glance, whether the article is a hot paper or a highly cited paper. At the Citation Network Panel, the hyperlinks are better organized with distribution of citations in various indexes listed. Other improvements include clearer display for Marked list and saving to Endnote although that is debatable for users who do not use Endnote ;P.
In conclusion, I think the redesign is a good move although I thought it could have been done earlier. The attraction, I foresee, would be the better integration and display of information from JCR and ESI to the article. The concern for librarians now is whether this little nip-and-tuck would lead to a price increase. I hope not.